Last night, I had the unique opportunity to attend Astronomy Night on the National Mall. 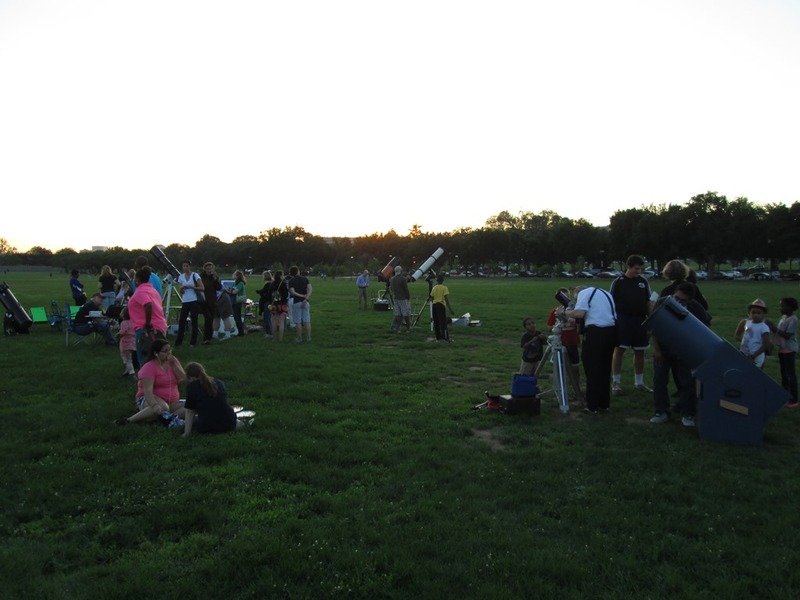 A small crowd had started gathering as people set up their telescopes and calibrated them for an evening of stargazing. There were astronomists and astrophysicists all around with impressive telescopes pointed at the sky. I just missed viewing the sun through a special filter, but I was able to view the moon several times last night. 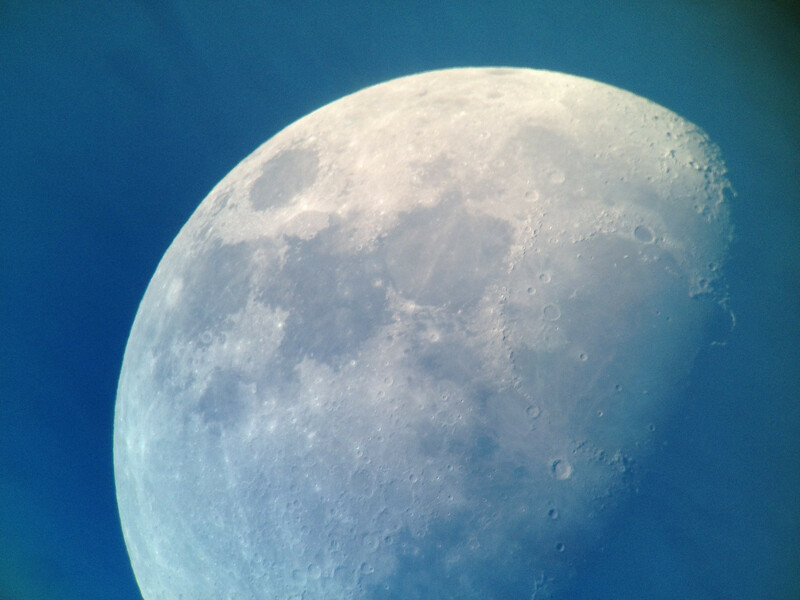 I could see all the craters of the lit parts of the moon and it was beautiful, and this was at dusk. Its brilliance only grew as the sky darkened. I wish I was able to photograph what I could see through the telescope’s lens, but I wasn’t able to maneuver my camera properly. 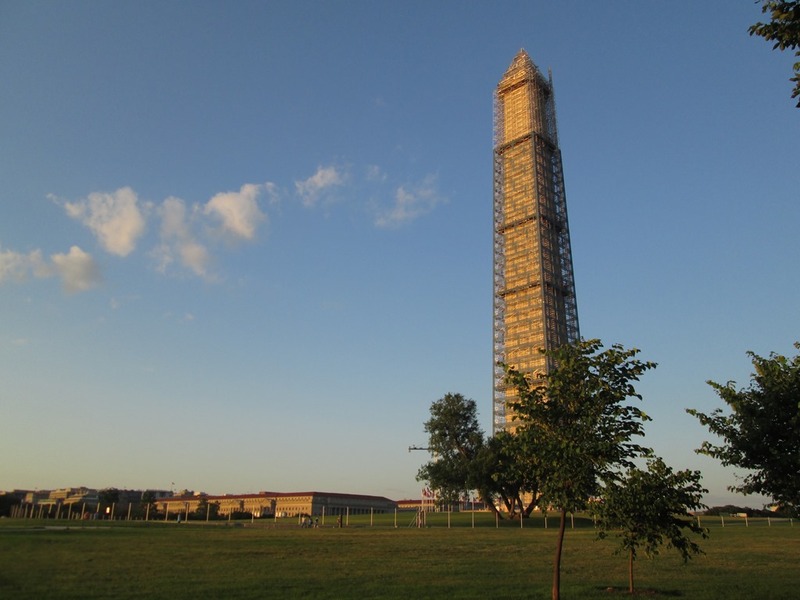 It was incredibly humbling to walk past the Washington Monument, which is undergoing some large-scale renovations to repair the damage done by the 2011 Earthquake. My photo of the Washington Monument, looking different from every other time that I’ve seen it. As it grew darker, we started to see a few stars emerge. I was able to see Venus and Mercury peeking at us through the still-red sky as the sun was setting. Another star would start twinkling at us and then my friend alerted me to the fact that people were focusing their telescopes on Saturn. Saturn, the 6th planet from the sun and the second largest planet behind Jupiter. It has been my favorite planet for over a decade now; I used to doodle its astronomical symbol in the margins of my classwork. ( ) According to some of my friends, it’s strange to have a favorite planet. Um, my name is Starr, it would be strange if I didn’t have a favorite planet. Or favorite nebula. Or favorite constellation. But I digress. I love Saturn because of its extraordinary rings and its moons: Saturn has over 60 moons, losing the moon game narrowly to Jupiter. (Although its difficult to accurately count all of either planet’s moons.) I have been fascinated by Saturn since I was first able to name all the planets of the solar system (including Pluto, way back then…). I stood in the growing line to see Saturn and found myself getting anxious. Would it be just a shining speck like Venus appeared? Would I even be able to see it with my lifelong struggle to look into scopes correctly? I wasn’t at all disappointed. I looked into the eyepiece, and even though Saturn was moving rapidly out of the field of vision, I could see it. I could see Saturn’s rings, and I could see the shadow that the rings cast against the planet. I could see the Cassini division (the large gap between the rings), and I could see moons. Titan, shining brightly to the left and a few smaller moons behind it. This is what I could see… but my view was even more spectacular. But I was. I was so awestruck by the beauty of Saturn. Was this how Galileo felt when he first saw the rings of Saturn? What was greater, I wonder: the feeling of seeing a planet for the first time and discovering that this celestial body had rings? Or admiring said planet through other people’s eyes for years before being able to look directly at it for the first time? Even after a minute, I was still stunned speechless. I laid down on the grass, staring up at the gleaming dot that I now knew to be Saturn. The word “mortal” kept entering my mind, as in “How can a mere mortal such as myself behold such beauty in my eyes?” I was still tearing up as I gazed at Saturn, knowing that I was able to see its rings. I eventually got back in line twice for two more looks, and its magnificence wasn’t lost on me a single time. As I walked away from the event, my thoughts shifted from the magnificence of the heavens to the marvel of mankind. We, as humans, were able to construct a tool that allowed us to look at the multitude of sparkling somethings in the sky and see. I was able to see Saturn, 887 million miles away from Earth, because of the amazing telescopes that were forged by humans, some of which weren’t even automated. Trying to track Saturn as it blazed through space was fascinating in and of itself, but there were telescopes that were programmed to track Saturn as it sped across the sky. Not only was mankind capable of creating instruments as wondrous as the telescope, but the people at this event were so kind. They traveled from far and wide, many of them citing jetlag from long flights or cramps from hauling their telescopes in their vans. The larger telescopes each cost over $10,000, not including the modifications and maintenance and any repairs. And these scientists allowed the general public to look at the heavens for free. They answered my friends’ questions about why stars twinkle and how did they even get so much cheese on the moon anyway? I sat on the subway leaving DC thinking about the magnificence of the heavens and the marvel that is mankind.